It's a sure bet that your teenagers are always hungry and in a hurry. Teaching them how to make nutritious meals in a microwave is a great way to teach cooking skills and provide a quick meal for their busy schedules. Just about every kid loves tacos, and microwave tacos provide a tasty dinner for the hungriest of kids. To get started, place enough hamburger for two tacos into a microwavable bowl, cover, and cook using high for 5 minutes. Remove the fat, and sprinkle on cumin, garlic and chili powder according to taste. Add a small amount of water to cover the meat. Microwave 4 minutes using high. Fill your taco shells with the mixture and top with grated cheese, salsa and lettuce. Microwaved pizza is ideal for dinner or a quick lunch. Simply, toast your English muffin and dice assorted toppings of olives, pepperoni, mushrooms and green peppers. Place a tbsp. of spaghetti or pizza sauce on each muffin half. Top the muffin with grated cheese and add toppings. Put the muffins on a microwavable dish, and heat with full power for about 40 seconds or until cheese is melted. Kids can easily whip together a yummy egg breakfast to start their day off right. Using a microwavable mug or large cup, add a dash of salt and a few pre-made croutons. In a bowl, combine diced pre-cooked bacon, grated cheese and two eggs. Stir the mixture thoroughly and add it to the mug. Cover with croutons and plastic wrap. Microwave on high power for 1 minute. Serve with salsa if desired. Teens can easily make s'mores by placing a half of graham cracker on a plate or paper towel, adding ¼ of a chocolate bar and topping with a large marshmallow. Microwave on high for about 10 seconds until the chocolate and marshmallow just begin to melt and puff up. Cover with the second half of your graham cracker, let cool slightly and enjoy! 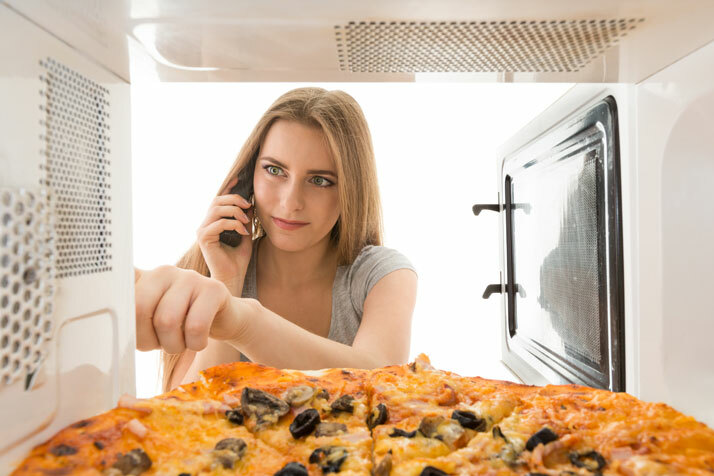 Once teenagers learn how easy it is to whip up yummy meals and snacks in a microwave, they'll catch on in no time.